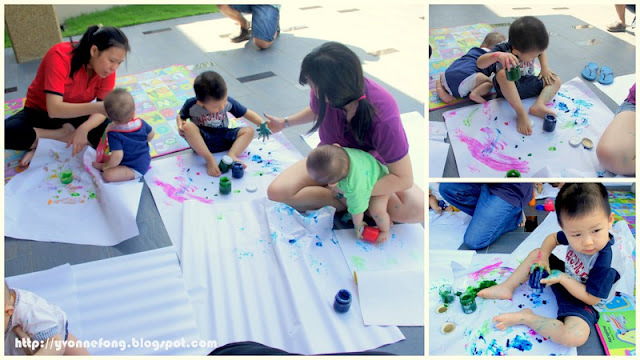 Last weekend we have this finger painting theme for our playgroup.. and the kids are super enjoying themselves with the painting.. some are enjoying eating it too.. they are so cute and adorable.. I love to see their big smile and they all all engaged in the painting for about 45 min or so..
for marcus he doesn't really like his hand dirty sometimes.. so he will ask to clean his hand with is dirty.. but this time you look at him.. he is so enjoy with the painting too.. and he is big enough to know that those painting is not edible and he doesn't eat it at all.. my marcus boy has grown up.. :) he is now more open and have interaction with other kids and adults.. 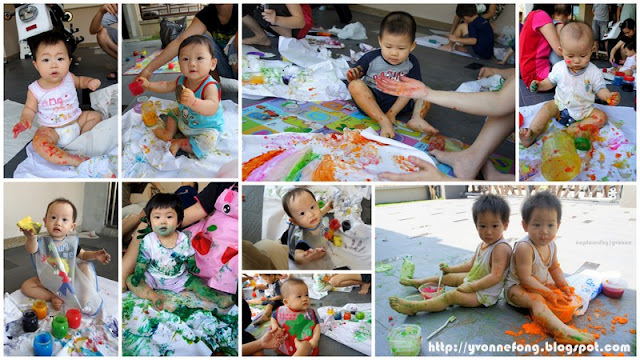 I am great to see his improvement and all paid well for the effort i put in for organising the playgroup for everyone.. satisfying!!! Look at the babies below.. they are so so lovely right? ?